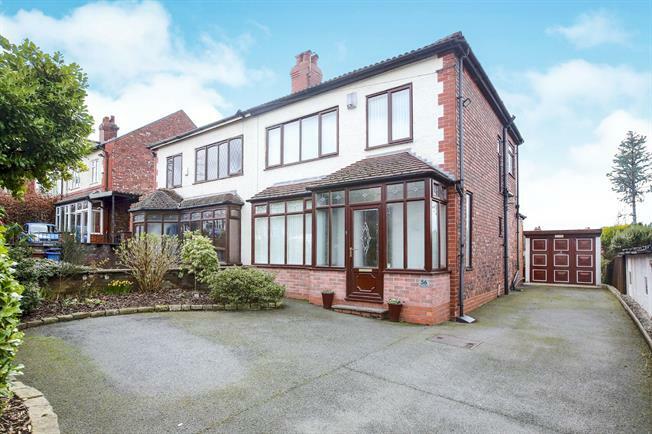 3 Bedroom Semi Detached House For Sale in Stockport for Offers Over £300,000. This beautiful property offers an ideal opportunity for a young family or first time buyer to acquire a 'simply ready to move into' home. The property has been lovingly improved over many years incorporating period features whilst modernising the property to high standards and is bright and spacious throughout. The property sits on a large plot, ideal for future development in the way of extension. The property could be extended to create even further living space and still benefit from a good sized garden. In brief the property comprises entrance hall with cloakroom, bright living room with period fireplace, dining room and modern fitted kitchen. To the first floor are three good sized bedrooms and modern fitted bathroom suite with vanity unit . The front of the property is a driveway providing parking for several vehicles along with a detached garage. To the rear of the property is a good sized garden, laid mostly to lawn with raised paved patio area.